Sweep out the cobwebs, shake out those shadows. Sometimes we need to go right back to where we started. In Arles, after moving in and wandering the cross-caught streets, I fell fast in love with the tales of its shutters and doors. Cliché, absolutely, and some would say that I should now move beyond those facile waters...but...but...there was a day, not so long ago, when the sky was so blue that it tricked me back to the beginning of seeing one street as I had in the before of before, allowing me to dip in just one more time. 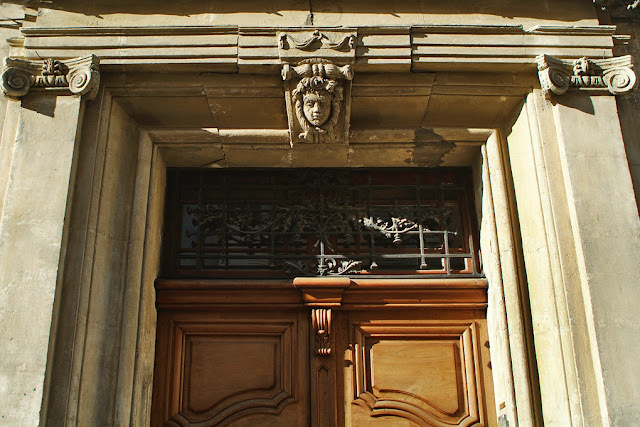 Instead of hurrying along the far too narrow sidewalk, I stepped out into the rue de l'Amphithéâtre, camera in hand and lifted. I had easily half an hour to spare before my doctor's appointment. All was quiet, the tourists still sleeping. The light was flirting. A passer-by gave me a slight nod of recognition, someone else from the center of town. I love Arles before showtime. When history stretches and yawns before settling in to be admired. Now I can add my own little histories to its two-thousand some years that are more patient than I will ever be. On this particular stretch alone I remember...my mom and I struggling with our suitcases on the bumpy pavement against a winter Mistral wind on an early descent from Paris to visit an apartment that would not work out. Being invited to a party where rooms opened upon rooms until fading into darkness and everyone was trying too hard to be casual. Pulling Ben and Kipling out of the way of a roaring car, music blaring, with only inches to spare. Perfect imperfect these memories, just like the patina scribbled on the surrounding walls for all to see. No need for them right now. So I snapped back, quite literally with a click-click, present-bound and looked without judging and felt a tiny lift of joy without judgement too. 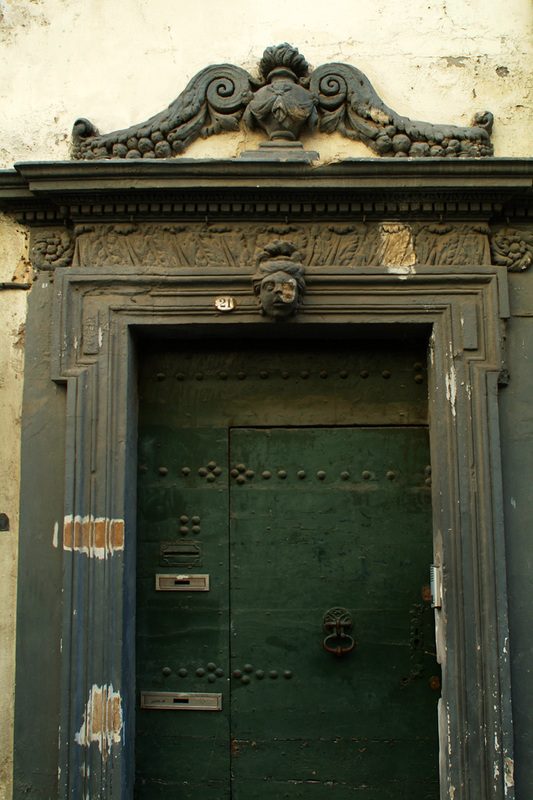 The worn faces above the doorways winked conspiratorially before I turned into the shade of an alley, a short-cut but also a window closing. It is funny that it is no longer one of the more fashionable streets to live on, despite leading directly to the Arena (or maybe because of it); it clearly once was and perhaps will be again. Sometimes, we need to go right back to where we started. Arles, eternal and ever the heady mix. Who says all roads lead to Rome? Susan, I definitely think, actually know that we see France with fresh eyes. Time and time again I have had locals ask me, "What are you looking at?" ;) I don't think that we are necessarily more romantic...the objects are romantic in themselves! Gorgeous! I absolutely love that deep dark golden green. Why do I only seem to notice that color as French on your blog? I love blue shutters of course but it's nice to see green. It is a really traditional green here. Although I have just learned that the 18th century green was brighter, more of a kelly green. That bright but saturated green is my favorite color...it always resonates with me. I probably decided to purchase the house we live in because the kitchen used that green (to brilliant effect). I learned the hard way, however, not to use that color on the trim of the outside of a mid-century modern house surrounded by the greens of deciduous and fir trees. The painted green did not live happily with the very different greens of the trees or the house's absence of architectural distinction. Learning, Leslie in Oregon P.S. I enjoyed and learned so much from this post! Love the orange and aqua.... always good to take a fresh look at old places — and even better when you take us along with you! Merci Judith. 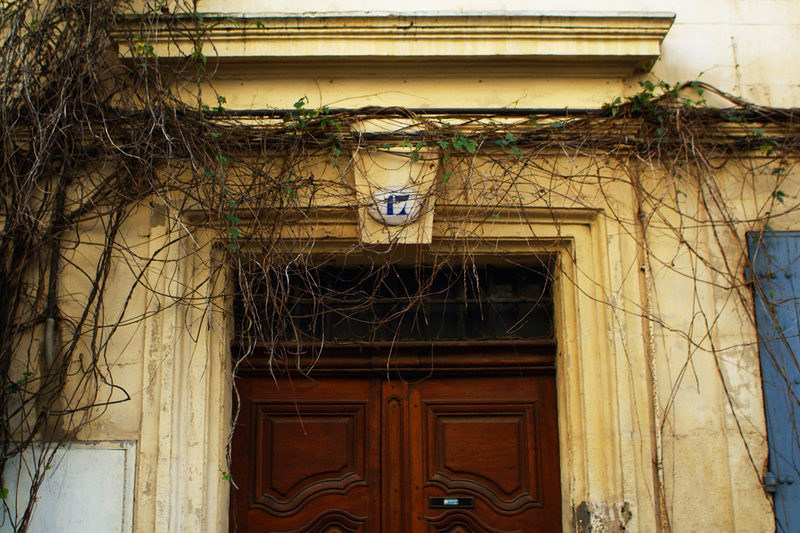 I know that I have already posted that doorway before at least once but it is worth repeating...hopefully. I like the photos of the doors of different shapes and colors, the winetered ivies that look like a crucific with blue shutters one on each side and your accompanying text. Very beautiful piece of writing, Heather. 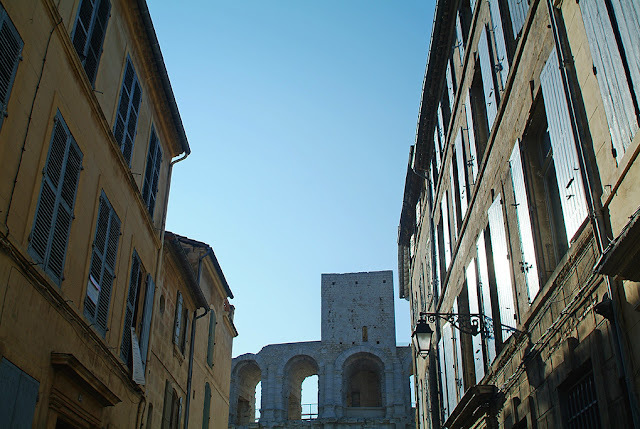 A real "Lost in Arles" again! But also short cuts of "looking back". Reflections of the sun. Just in time, as you know I was doing a lot of thinking about Arles today. 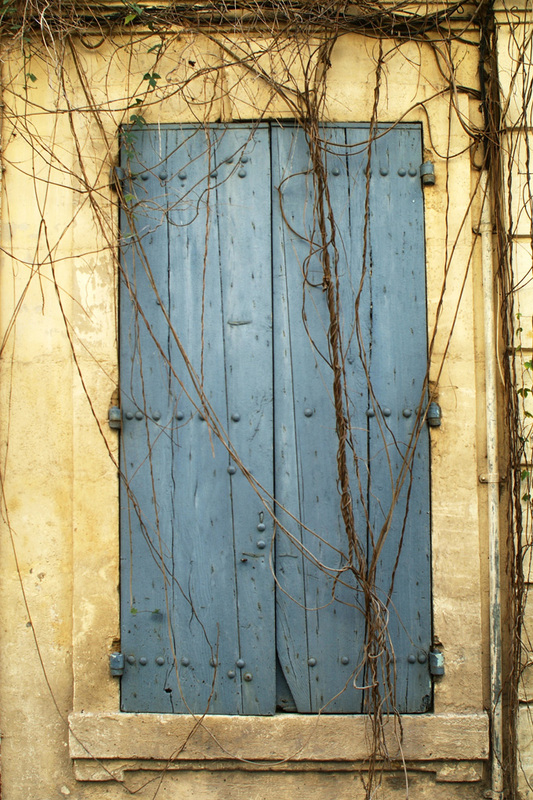 And of course I would LOVE Arles before showtime. BEFORE showtime is the most exciting time to me. All ways lead to Arles? You know that name of the blue that the shutters are painted in? I can't google it. 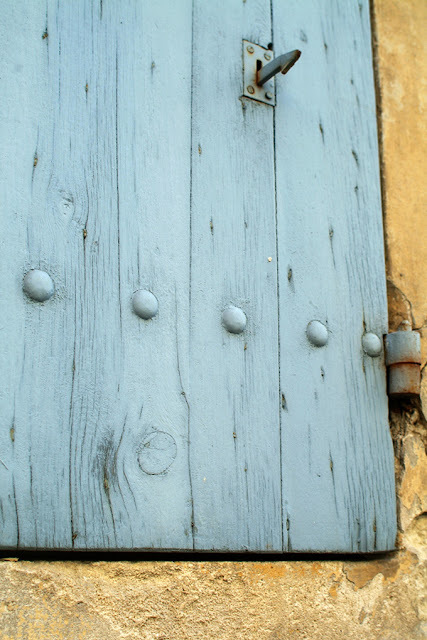 Is it that French Blue that was used before Indigo was invented or found? Thank you for taking us along again! 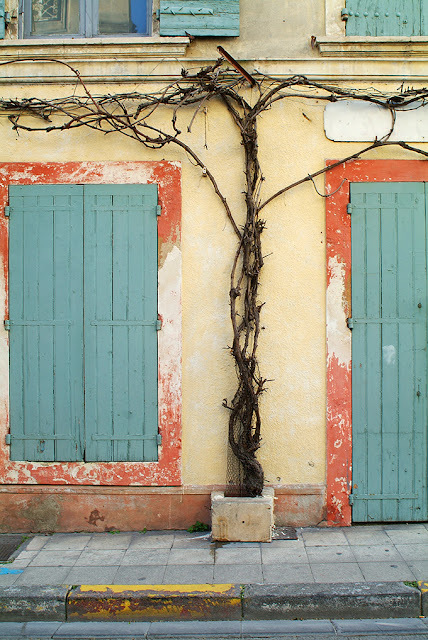 We never tire of seeing your Arles photos - there is so much to love in them! Always a new discovery - is that a monkey face? And I agree with the first commenter; I think I've always delighted in every cobblestone and patina in Europe but frequently ignored beauty in other places - NYC which was my home forever! Now I actively appreciate my country living; since we spent part of our youth in the country, maybe I have gone back to where I started? Lovely concept - gives one hope! I love your way of thinking about it - but I disagree! In NYC you were always pointing out beauty - the way the light shown on a building, the buds in Central Park. 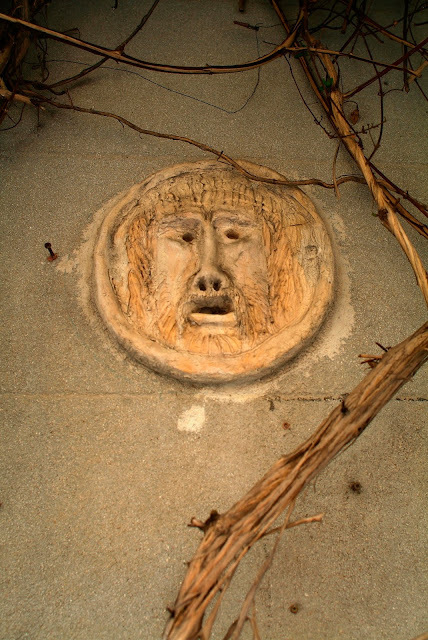 And I think the face that you are asking about is a mini, handmade version of the Bocca della Verita in Rome! You are right, it has been a while although my fondness for you never fades lovely Catherine. I hope all is going well for you. I wrote recently that I recently started a meditation practice - so I am really trying to slow things down in a positive way! As always, such gorgeous photos. Evocative, character filled, with much promise of story telling in each image. You take Ben and Kipling with you when you go to the big smoke? I guess it has memories for them too! No, the boys haven't been back, Deb. But they both know it like the back of their paws!! Ben spent most of his life there. 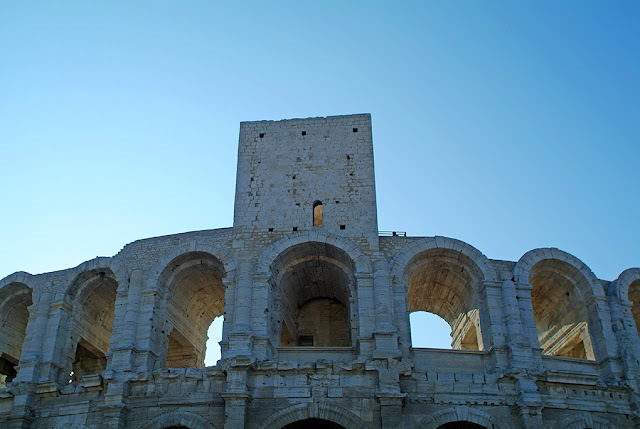 The train from Paris, where I then lived, to my first visit to Arles and off to Hôtel de l'Amphithéâtre , on your street. Lily of the Valley sprigs in place, we put down our bags and walked just yards to the wonderful welcome: the May First events in the Amphithéâtre. A long time ago, but with your wonderful photos Heather, almost on the eve of May 1st, it's as fresh as yesterday. merci. It is impossible to think that the May 1st events are nearly here again. Such a beautiful memory, Joan. What timing! And the Hôtel de l'Amhpithéatre was always our hotel too. It was where my mom and I were headed on the day of the Mistral! How utterly beautiful, Heather. Your photography is stunning. Those colors and the carved stone doorways are so evocative and it's lovely to read about what they mean to you. 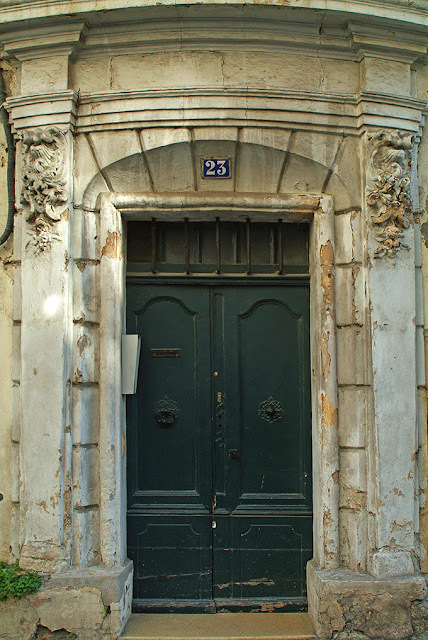 Katherine, if it came down to it, I could most likely write such a post for nearly every street in central Arles! I have no doubt you could. Thank you, dearest Heather. By all means do, Bonnie. You know that it will be worth it! Beautiful as always, Heather! 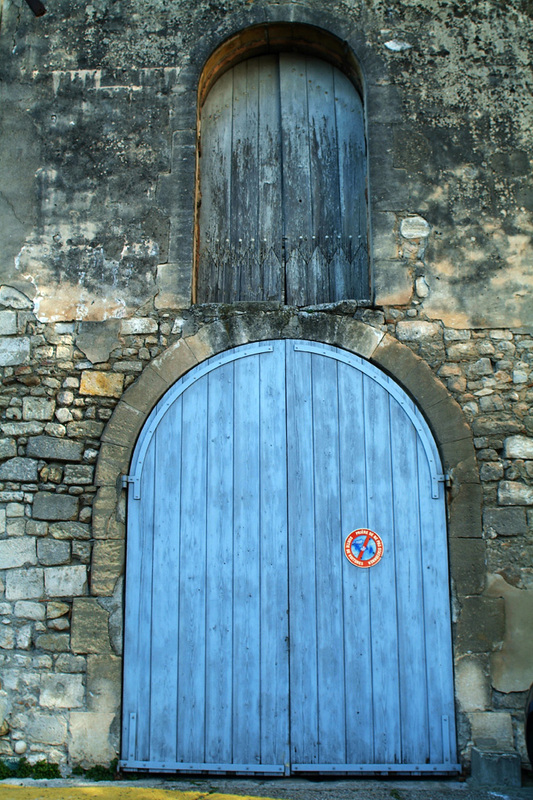 And the idea of Arles before showtime is very appealing! I am in countdown mode, packing and unpacking that suitcase in my brain. A friend of mine lives in a tiny house just next to the Arena. When she took the house, she was told that her bedroom in the basement is part of a tunnel that the gladiators used to enter the arena. I can't even imagine the dreams THAT energy must produce. I am so curious as to which house belongs to your friend! I'm glad to see that I'm not the only one walking around taking photos of doors and other such 'things'. People here look at me really strangely when they realise I am not a tourist. I guess they think I am planning a break-in or something. As always, your writing is just so dreamy and poetic. I enjoy it immensely. Yes, I have had that same look! And of course you take photos all over Malte...I would too! But thank you so much for asking! Wonderful color & patina in these photos, Heather. I also love the bare vines that cover the doors & that amazing stone face! Enjoyed reading the recollections you had while walking those streets. You said it best with "perfect imperfect". I ADORE OLD DOORS.............especially with PATINA!